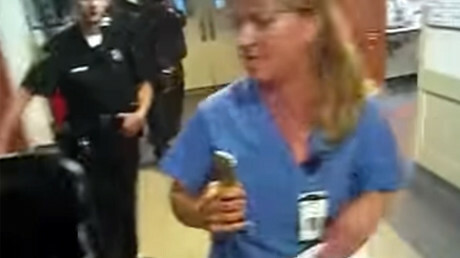 The detective who violently arrested a Salt Lake City nurse for not allowing police to draw blood from an unconscious patient is now the subject of a criminal investigation and on paid administrative leave. Salt Lake County District Attorney Sim Gill announced Friday that he wants a criminal investigation into the July 26 arrest of University of Utah Hospital nurse Alex Wubbels. The arrest was captured on multiple police body cameras. "In fairness to all those involved I have requested a criminal investigation into the incident so that the District Attorney's office could screen the matter after gathering all the facts," Gill stated. "Our office had not received any materials on the matter thus far and in the interest of justice and given the prima facie evidence a criminal investigation is warranted." Salt Lake City Mayor Jackie Biskupski said as a result of the criminal investigation, the arresting officer, detective Jeff Payne, will be placed on full administrative leave with pay. Mayor Jackie Biskupski called Payne’s actions “completely unacceptable to the values of my administration and of the values of the Salt Lake City Police Department,” in a statement Friday, the Tribune reported. “I extend a personal apology to Ms. Wubbels for what she has been through for simply doing her job,” Biskupski added. An Internal Affairs investigation that will examine the actions of the arrest, will work with the Civilian Review Board in a parallel investigation, according to the Salt Lake City Tribune. Police Chief Mike Brown described the severity of the case. “I was alarmed by what I saw in the video with our officer and Ms. [Alex] Wubbels. I am sad at the rift this has caused between law-enforcement and the nurses we work so closely with. I want to be clear, we take this very seriously,” he said, the Tribune reported. Brown added that his department “apologized” and “promised to find a solution,” as well as continue to improve training and policy by communicating with hospital staff. On Friday afternoon, Wubbels issued a statement of her own, acknowledging the “sincere” apologies from the police chief and the mayor. She added that she would be “working with both of them to help promote further civil dialogue and education." The district attorney lauded the mayor and police chief for coming together behind the criminal investigation. “Both Mayor [Jackie] Biskupski and Chief [Mike] Brown agreed that it was appropriate and I thank them for their commitment to transparency and institutional accountability,” Gill said in a statement. The arresting officers shown on the video were looking to draw blood from a critically injured unconscious semi-truck driver who had been the victim of a head-on collision with a suspect fleeing police. The hospital’s policy states police can not draw blood from an unconscious patient unless they have a warrant, there is prior consent, or if the individual is under arrest.